The preservation of old buses and coaches in the Midlands began in 1964. The veterans were kept in factory and farm yards, wherever a kindly soul could be found. Unfortunately, kindly souls would move on or local authorities turn unfriendly and the search would begin again for another home. Every so often ideas ran out and a vintage bus, priceless today, would have to be scrapped. The Birmingham Omnibus Preservation Society, the predecessor of this museum, was formed in 1973 and originally had to use such sites for its vehicles but realised it was no way to carry on. The new society set out to preserve the buses nobody else would touch, difficult to restore pre-war buses in poor condition! We bought our first post-war bus in 1976 and learned a valuable lesson as membership numbers grew considerably, showing that history did not just mean pre-war! Following two years of hard work, the society became in November 1977 a legal trust, known as the Birmingham and Midland Motor Omnibus Trust, which was soon accepted as a registered charity by the Charity Commissioners. In its new form, the Trust was able to conclude its most important move forward yet. 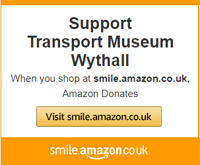 The Trust took possession of 1.17 acres at Wythall on 1st February 1978 and from this totally derelict site grew the Transport Museum of today. We are on part of the former RAF Wythall base, built in 1939. The site was completely derelict - there were no buildings and most of the land was mud. The first bus to attempt to reach the site got bogged down in the mud on the entrance 'drive'. There was plenty of rubble about and, with the minimum of equipment but plenty of enthusiasm, volunteers basically laid a roadway by hand. A hard area on the site was similarly constructed for the buses to stand on. More rubble had to be laid before each vehicle could be received! Dreams really began to come true in June 1980 when the first stage of the first building was completed. Doors and a solid base may have been missing but a dozen buses - including double-deckers - had a roof over their heads. The site was opened to the public for the first time in September 1980 when a Preview Day was held. Since then it has been steady progress. At first all efforts were concentrated into the Museum buildings. It was not sensible to restore vehicles and then keep them outdoors! The Museum was demonstrating that it meant business and began to attract grants. A grant from the now defunct West Midlands County Council enabled us in 1984 to treble that original building in size, concrete part of the floor and put in a maintenance pit to help get the collection on the road. A disused single storey building was purchased and reconstructed at the Museum by volunteers early in 1985. This became the much appreciated cafeteria and shop. During 1990 the museum site was expanded to 3.5 acres and a second large display hall erected with the financial assistance of Swedish manufacturer Scania whose contribution is commemorated in the name of the hall. We had bought the metal frame some years previously; Scania largely covered the cost of erection and cladding. In return we restored the first double-decker sold by Scania to London Transport; this bus is now displayed in Scania's museum in Sweden. Today also known as Hall 2, the hall houses the reserve collection for our exhibition hall and you can wander among the exhibits, most of them restored. The Museum began to diversify and the rear of Hall 2 contains our collection of battery-electric road vehicles. The orthodox motor vehicle had replaced the horse in most activities by 1930 but horses continued to hold an advantage for frequent stop-start work such as daily house-to-house deliveries by dairies and bakeries. The evolution of the battery-electric vehicle changed that, being ideal for stop-start work and not using any fuel during the frequent stops, and gradually replaced the horses. The Midlands were an important area for the manufacture of electric vehicles, over the years at least thirty different companies within fifty miles of Birmingham built them. Since acquiring our first battery-electric in 1986, we have established an important and unique collection of these vehicles supported by a sustained restoration programme. A substantial car park was opened in 1995. The following year, the Elmdon Model Engineering Society joined us and soon constructed the miniature passenger-carrying steam railway to delight families, completing the full circuit in 1998. It can be run with rolling stock built to three track gauges. The railway circuit is approximately 1,000 feet in length and is enhanced by shrubs and flowers planted by the EMES. The EMES in 2007 reconstructed the main station, Elmdon Halt, with a new platform and splendid canopy, and a passing loop. By the Millennium we were again struggling, the root cause of much frustration being insufficient covered accommodation for our now large collection of large vehicles! Erecting a new building was an obvious if expensive need but it had to be sited without hazarding the potential of the rest of the grounds and avoid a very large, important drain that runs across the middle of the site. We approached the Heritage Lottery Fund for assistance. The HLF recognised that we had comprehensive collections of restored vehicles that needed much better standards of display. We worked up a scheme for an additional hall, the first on site to be insulated, that would revolutionise our quality of exhibition. We added our savings to the HLF grant to permit a redevelopment costing just over a million pounds. In addition to the exhibition hall, the full project included obtaining the freehold of the land to protect the investment, a parts store, an additional circulation road, hard surfacing throughout, full wheelchair access, a new toilet block, a mezzanine in the workshop area, a bus terminus, plus shop and cafeteria refurbishments - the last being assisted by a grant from the Esmee Fairbairn Foundation. The project did not fund any work on the vehicles so the museum stretched more of its own money to give several buses considerable attention before their transfer to the new exhibition area, officially Hall 1 but popularly known as the Power Hall. The project was completed on time and within budget, supported by a terrific amount of volunteer work from our members. The new hall opened fully to visitors for the first time on May 6th 2007 when visitors encountered a museum that looked very different, particularly as volunteers had worked very hard facelifting the rest of the museum grounds. The Power Hall is named after Midland Red's Traffic Manager, Mr Orlando Cecil Power, whose expertise allowed the bus company to become the biggest in England and Wales outside London. Mr Power was regarded very affectionately and an impressive bronze memorial plaque, purchased by employees after his death in 1943, graces our Art Depot area which contains lots of examples of bus company art, photographs and film. The rest of the exhibition hall showcases in a colourful and enjoyable manner why the bus manufacturing and operating industries evolved in the ways they have, including the outside pressures on them, and how buses changed people's daily lives. Imaginative displays and information kiosks link artefacts with buses of all shapes and sizes, and there are audio-visual facilities and interactives to stretch the imaginations of the youngsters. We have named the various roads on our site. Station Road logically leads to the miniature railway station and a small bus station. One of the big ambitions of the 2007 project was to provide a background in which our vehicles could look at home. We are concentrating much of the street furniture we have collected into Station Road where the backdrop is the Power Hall with its brick facade designed to look like a Midland Red garage built in the 1920s and '30s. On both sides of Station Road are bus shelters of different eras and designs, accompanied by delightful Bundy time recording clocks and a telephone kiosk. Also to be seen is the AA garden. In the days long before mobile phones, the Automobile Association (AA) and the Royal Automobile Club (RAC) used to maintain call boxes so their members could ring for mechanical help - each member having a key to gain entry to the boxes. Eventually there were nearly a thousand AA boxes. Patrol staff improved their appearance by planting flowers, shrubs and building other special features around them. Our AA call box came from Bearley on what is now the A3400 and was re-erected after restoration in 2008. Like the AA boxes of years ago, a garden surrounds it. Wythall is today the spiritual home of the old bus companies and municipal transport operators in this area. Its halls not only accommodate the largest collection of preserved Midland Red and Birmingham City Transport buses but also buses and coaches from many other operators, generally either built or operated in the Midlands. The collections continue to grow and an insulated extension to the side of Hall 3 opened in 2012. Hall 3 is our original building, also known as Mr Shire's Garage, and is named after Midland Red's brilliant Chief Engineer until 1940, Mr L G Wyndham Shire. This is where most of our engineering, maintenance and conservation work is done so access is partly restricted. You can see just how much restoration is required on many vehicles and dwell on how many hours have been spent on the exhibits in the other halls. During the winter of 2017 Hall 2 was extensively upgraded with a new roof and insulated cladding.